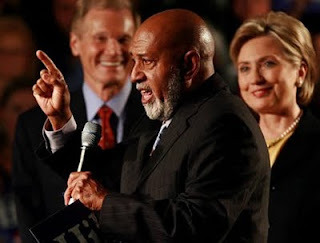 Rep. Alcee Hastings of Florida has sent an open letter to President Obama about his want for an end to Don't Ask, Don't Tell (DADT). He stated that he is "deeply disappointed" that the ban on openly gay and lesbian military personnel has not be lifted. This letter is a follow up to a letter delivered to the President in late July calling for and end to the anti-gay process the military uses to keep LGBT soldiers in the closet. The intial letter was signed by 77 representatives and called DADT a "ridiculous, bigoted law." According to the Advocate, "The Florida Democrat, who is the vice chairman of the Intelligence Committee, said he was also disappointed that President Obama had not responded to the initial letter. 'With the recent addition of 17,000 American troops to Afghanistan and the possibility of another request for even more troops from General McChrystal in the coming weeks, I am sure that you will agree that we cannot afford to lose any of our dedicated, highly qualified service members to 'don't ask, don't tell,'" he wrote in Thursday's letter. I personally am hoping the President will soon follow through with the promises he made while running for office. As a candidate he seemed to be one of our greatest allies. Now I'm waiting to see that promise fulfilled.